Thanks for visiting our Available Kittens Page. Visit us often as we always updating this page. 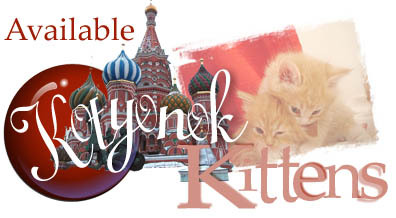 Kittens are put on a first come first serve basis so it is always best to fill out the Waiting List Form to be safe in securing just the right Siberian Kitten for you and your family. Each adoption comes with a full health guarantee. Is the Siberian breed right for you? A Siberian is for you if you want a warm, friendly cat that will be a loving companion. The Siberian loves other pets and will seek your human attention as well.